The October 29th entry, 'Up or Down,' said "If anyone, most especially a politician, uses a day's (or even week's) movement of the Dow Jones Industrial Average or S&P 500 Index to support a financial or economic argument, then you immediately know that they are either a fool or a knave!" To this statement one can evidently add "blogger/political argument." 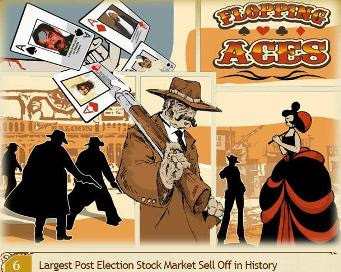 An example of fools and/or knaves - the "aces" who came up with this: "969 point drop since Tuesday’s close. Nearly a 10 per cent drop! The selloff started immediately after Obama’s election."